KWIKSET 925 Kevo Single Cylinder Bluetooth Enabled - ASK Locksmith, Inc.
Kwikset Kevo Bluetooth Enabled Deadbolt, Compatible with iPhone 4S, 5, 5C, 5S, 6, 6 Plus, 3rd Generation or higher iPad/iPad mini and 5th Generation iPod Touch. Android 5.0 compatible on select devices. With Kevo, your Smartphone is now your key. No more fumbling for your keys. Keep your phone in your pocket or purse and just touch the lock to open. No Smartphone? No Problem. Enjoy the same touch to open convenience with the fob. NEW! Kevo now works with Nest thermostats to let it know when you come and go to set your personal temperature preference, saving energy and reducing your utility bill. Electronic: multiple levels of military grade PKI encryption. 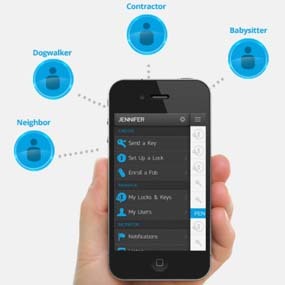 Key Control: no matter where you are - work, vacation, or on the road, if something goes wrong in your home, you can remotely provide temporary access to those who need it. Positioning Technology: Kevo can determine if you are inside or outside the door to help prevent unauthorized entry. Auto-calibration automatically enables this technology and adjusts Kevo continuously to the best security. SmartKey Deadbolt Cylinder: passes the most stringent lock picking standard UL 437, par 11.6, and BumpGuard to prevent lock bumping. Send an electronic key (ekey) to family, friends, or visitors who have a compatible smartphone so they can use their phone as a key too. 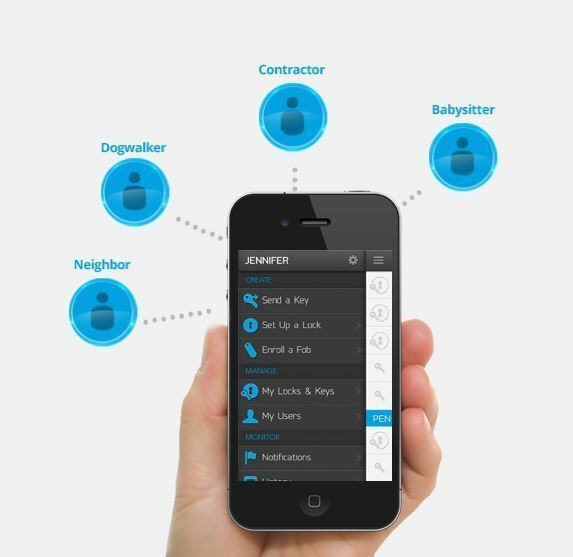 Mobile App Convenience: The Kevo app assists in initial setup, sending, disabling and deleting eKeys, viewing history of lock activity, and setting up other configurable features and options. The app runs in the background on your device so there is no need to open the app to enter your home. Kevo apps available on both the Apple App Store & Google Play for selected Android 5.0 Lollipop devices. No Smartphone? No Problem: enjoy the same touch to open convenience with the key fob. 2 eKeys included. These eKeys never expire, can be reassigned from one person to the next, and can be designated either Anytime or Scheduled. Additional eKeys are an in-app purchase of $1.99. Also included are free, unlimited Guest eKeys. Guest eKey: This free eKey allows you to give your Guest unrestricted access for a 24 hour period and will then be automatically deleted. If this eKey is not used within 24 hours after the eKey has been sent, it will expire. Guest eKeys are unlimited and can be sent to the same person or different people each time. Scheduled eKey: This eKey allows you to pre-set time constraints for the recipient. You control the days and the time of the week when the eKey will be active. This eKey never expires and can be reassigned from one person to the next as a Scheduled or Anytime eKey. 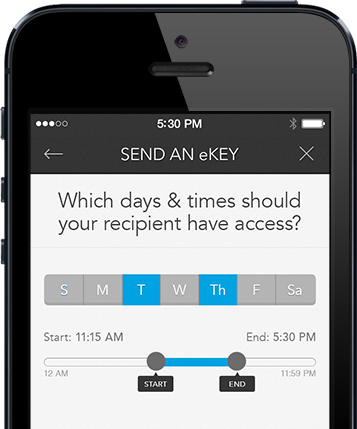 Anytime eKey: You can send this eKey to anyone, anywhere, anytime. This eKey never expires and can be reassigned from one person to the next as an Anytime or Scheduled eKey. The Kevo Bluetooth Enabled Deadbolt also works with a traditional key and features SmartKey re-key technology. With SmartKey you can re-key your lock yourself in 3 easy steps. This product contains one Kwikset Kevo deadbolt, one deadbolt interior, one fob, two keys, two electronic keys, 4 batteries, latch, strike, mounting hardware, installation instructions, user manual, SmartKey learn tool, and drilling template for new doors. Can someone hack into my Kevo lock? The Kevo lock does not only rely on the built-in encryption available in Bluetooth. Kevo also provides multiple levels of military grade PKI encryption. What is the battery life? The Kevo lock operates on 4 AA batteries and with normal use, the batteries should last for a year before needing replacing. The lock provides multiple low battery indicators and provides plenty of warning to change batteries. In the event that the batteries are not replaced in time, you will need to use the standard key to unlock the door. When I’m inside the house, can someone touch the Kevo lock to unlock it from the outside? No, the Kevo lock has a unique and patent pending feature to detect if the authorized user is inside or outside of the house, so there will be no accidental unlocking from an unauthorized user outside. How will the Kevo App affect my SmartPhone battery life? The Kevo App needs Location Services and Bluetooth to be on, which do use some battery power (you would already be using this if you use other mapping apps or Bluetooth devices). The Kevo App is designed to take advantage of the new ultra-power-efficient Bluetooth Smart Ready Technology, so you shouldn’t notice a decrease in your phone’s battery life. What happens if I lose my phone? Simply log into the Kevo app on another SmartPhone or into the Kevo web portal and disable or delete any eKeys associated with the lock. You will need to use your Kevo Fob or the standard key to unlock the lock until you retrieve or replace your phone. Kevo Compatibility The Kevo app is currently available for iPhone 4s, 5, 5C, 5S, 6 and 6 Plus, 3rd generation or higher iPad/iPad mini and 5th generation iPod touch along with select Android 5.0 devices Nexus 6, Nexus 9 and Samsung Galaxy S5. Kevo apps available on both the Apple App Store & Google Play. We have plans to support all possible mobile devices. Currently Android 4.3, as well as Blackberry 10.1, does not fully support all Bluetooth LE features required by Kevo, but we hope it will soon. When it does, we will be ready shortly thereafter. You can still enjoy touch-to-open entry with a key fob and migrate to your Android device when available.